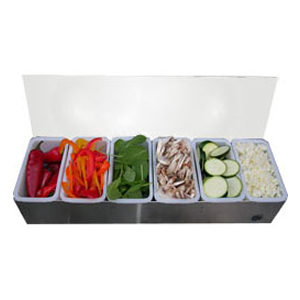 Our pizza topping organizer is perfect for both back-of-house prep areas and front-of-house self serve stations. Allow your guests to create their own sandwiches and salads, or keep your toppings in an easy-to-reach location as you make orders during busy meal times. Place it in a hotel pan or tupperware pan with ice to keep food items cold. Compartments are removable and dishwasher safe.